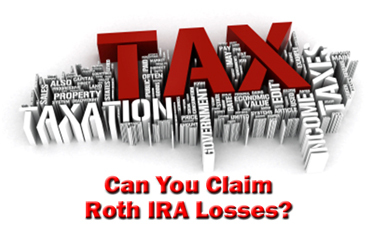 Can You Claim A Tax Loss On Roth IRA Losses? It sure would be good to know when you file your taxes this year. For instance, say you close your Roth IRA and the balance is less than the total amount of your original contributions. When you close that account, you take a loss, right? So, can you claim that loss on your tax return? You sure can, but before you do so, you must make sure you meet the conditions necessary for claiming a Roth IRA loss. Before you can even consider claiming losses on your Roth IRA, you need to close your Roth IRA. You can't claim a tax loss on your Roth IRA just because one of the mutual funds in your Roth IRA declined 40% this year. After all, the loss hasn't been realized yet. So before you claim a tax loss, you need to realize an actual loss. And to do that, you must close all your Roth IRA accounts. As discussed in Multiple Roth IRA Accounts, you only have one Roth IRA account, but you can host that account with multiple financial firms, creating the appearance of multiple accounts. To claim a Roth IRA loss, all of those accounts must be closed. For instance, let's say you have a Roth IRA account with both and Sharebuilder. You originally contributed $5,000 to each one. After a bad year in the stock market, your account is now worth $2,000, but your Sharebuilder account is still worth $5,000. Can you close the account and claim a $3,000 tax loss? Because you need to close your entire Roth IRA, meaning all of your open accounts. So, in this case, you can only claim a $3,000 loss by closing both your and your Sharebuilder accounts. If you closed your account at a loss, and you satisfy each of the above requirements, then you're eligible to claim Roth IRA losses on your tax return. In order to claim a loss from underperforming Roth IRA investments, your loss must exceed 2% of your adjustable gross income. For instance, let's continue with the example from above and say you wish to claim a $3,000 tax loss on your Roth IRA. Can you do so if your adjustable gross income is $55,000 per year? Because the $3,000 loss is greater than 2% of your adjustable gross income, you can claim a loss. So does that mean you can take a $3,000 tax deduction? Only the amount above 2% of your adjustable gross income is tax deductible. So, in this case, 2% of $55,000 is $1,100. And $3,000 minus $1,100 is $1,900. So, in this case, you can claim a $1,900 miscellaneous deduction on your tax return, because your losses were in excess of 2% of your AGI. But all of this begs the question... What constitutes a Roth IRA loss? What if your Roth IRA balance exceeds the amount of your original contributions, but your Roth IRA lost 50% of its value from the beginning of the tax year to the end? Can you claim a loss? In order to claim a loss, your Roth IRA balance must be less than your original contributions. In other words, you must be taking out less than you originally put in. Let's say your original Roth IRA contributions over the years amount to $15,000. You also converted a Traditional IRA, to which you originally contributed $2,000, to a Roth IRA. Then, a few years later, you took a tax-free, penalty-free $1,000 withdrawal from your original principal contribution. So if your Roth IRA is only worth $10,000 when you close it, you have a $6,000 loss. But if it's worth $16,500, you have a $500 gain... even though your total original contribution amount is $17,000. Remember, you took that $1,000 early withdrawal, and that comes out of your cost basis. Also remember, when you make a withdrawal from your Roth IRA, the first money to come out is your original contribution funds. 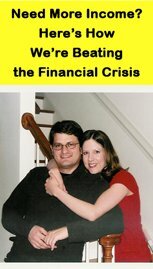 You can't begin to withdraw investment gains until you withdraw your original cost basis. In order to claim the losses on your Roth IRA, you need to report them as a miscellaneous deduction on Schedule A. But miscellaneous deductions are NOT deductible if you're subject to the Alternative Minimum Tax (AMT). So before you claim any Roth IRA tax losses, make sure you aren't subject to the AMT. Does this mean you can claim your Roth IRA loss? You also need to itemize your tax return. If you claim the standard deduction instead of itemizing, then you aren't eligible to claim a tax deduction for your Roth IRA losses. However, if you do itemize, then you can claim a deduction. In order to claim losses on your Roth IRA, you must report a loss on 'Schedule A - Itemized Deductions', NOT on 'Schedule D - Capital Gains and Losses'. This is a common mistake, because Schedule D is where you would expect to report these losses, so don't make this blunder. On Schedule A, a Roth IRA loss goes in the category of a "miscellaneous deduction". Just remember, you can only deduct the amount greater than 2% of your adjustable gross income, NOT the full amount of your Roth IRA loss if it exceeds the 2% threshold. So if you've been wondering if you can claim a tax loss on your Roth IRA losses, the answer is yes. But to do so, you need to close out your Roth IRA accounts. Is it really the best decision to close out your Roth IRA? Even though you may be able to claim a tax deduction in the current year, by closing out your Roth IRA, you miss out on any future gains you can withdraw in retirement. And remember, once you close out your Roth IRA, you can't go back and re-fund your new Roth for those past years in which you contributed. Once the April 15th deadline passes, you forever lose the opportunity to make a Roth IRA contribution for the previous tax year. So before you attempt to claim a Roth IRA loss, make sure you give this important financial decision the deliberation and thought it deserves. Return to the top of Can You Claim Roth IRA Losses?